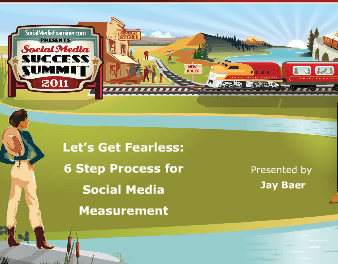 Can you measure social media? Of course you can. But social media measurement is not always easy. For a full and very specific account of how to measure social media in your company, pick up a copy of The Now Revolution, or Social Media ROI (by Olivier Blanchard). However, here are the basics to consider, drawn from my presentation “How to Hug Your Calculator” last week at Social Media Success Summit 2011. What makes social media measurement tricky is that HOW your company uses social media changes the metrics that makes sense for you. Remember, the goal is not to be good at social media, but to be good at business because of social media. Thus, you first have to understand your business level objectives, and how social media can support them. Not every company has access to the same social media metrics. If you’re an e-commerce company, you can measure different elements of your social program than you can if you’re not an e-commerce company. Understand what is possible, and then remove metrics that aren’t relevant. There’s only one way to calculate ROI (return on investment). It’s sales minus expenses, divided by expenses, expressed as a percentage. There is no other formula. But sometimes, getting at true social media ROI is difficult, especially on the “return” side. In those instances, you might opt to instead examine how social media success ties to business success over the long haul, and make correlation studies about that relationship. What you want to see is a situation where business success increased in lock step with social success (or slightly trailing social success). You can’t prove that social caused that success, but it sure looks fishy. True ROI is a better equation, but sometimes is too difficult to get at – and not just social media ROI, but the same goesfor TV, radio, print, event sponsorships, outdoor, and your customer service department. Once you’ve gone through the first 3 steps, you can pick actual social media metrics that make sense for your company. Pick them BEFORE you get heavily involved in social media, to reduce the temptation to pick metrics that support your position down the road. I’m a big proponent (as we discuss in The NOW Revolution) of picking approximately 3 social media metrics, and seeing how they “fit” for your company. Sometimes tracking too many social media metrics is worse than measuring too few. If you want your whole company supporting your social initiatives, it will help if the whole company (more or less) has access to the scoreboard. Don’t treat social media measurement results like the nuclear codes. Sharing your results will inspire the internal discussions and ideas necessary to take your program to the next level. It’s not mathematically defensible in the way social media ROI is, but you should try to include anecdotes in your social media measurement. Ask your operations, customer service, and community management teams to document circumstances where you turned lemons into lemonade, delighted a customer, or just did something awesome in social media. Sometimes those unique case studies create more internal support than a whole stack of spreadsheets.